There are some lines Bruce Bochy is willing to cross, and some that he’s not. 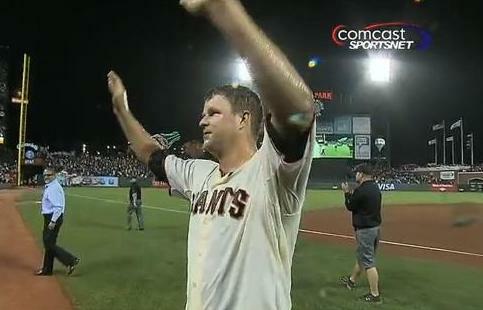 Case in point: Matt Cain’s perfect game Wednesday night. Bochy was willing to make some small changes: Emmanuel Burriss replaced Ryan Theriot at second base in the sixth, and in the seventh, Joaquin Arias slid from shortstop to third base, replacing Pablo Sandoval, with Brandon Crawford inserted at shortstop. When it came to warming up a pitcher, however, Bochy was significantly more sly. With a comfortable lead, he wanted a reliever ready should Cain—whose pitch count through seven was 103—give up a hit. The manager was cognizant, however, of the emotional toll the sight of bullpen activity can take on a nerve-wracked starter, so he had reliever Shane Loux warming up “down underneath,” either in the batting cage or in the tunnel below the stands. Far less tactful was first baseman Brandon Belt, who looked up from his seat in the dugout in the seventh inning, and was startled to see Cain in front of him. As if to follow suit, not only was the Giants television broadcast crew more than happy to reference the no-hitter, but prior to the ninth inning showed a “Giants No-Hit History” graphic, featuring each of San Francisco’s five previous no-hitters. Just goes to show that dominant pitching trumps jinxes every time. Update (6-15-12): Cain’s family is full of Code adherents.